Last week’s post on the Epiphany generated quite a lot of comments, and I was grateful to know that it had resonated with so many. Most of those who emailed did so to say that they too had wondered what had become of the gifts that the magi had delivered. One, however, speculated that Mary and Joseph had politely thanked the magi for their thoughtfulness but had then refused the gifts. 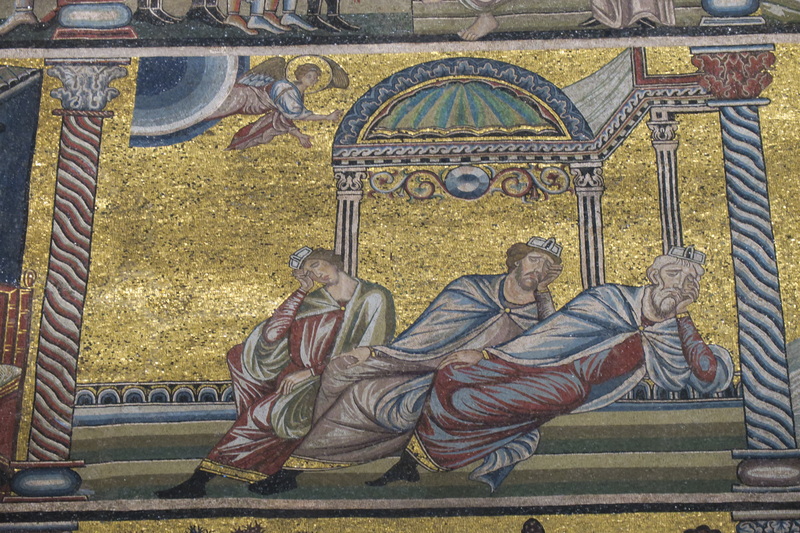 Gold, frankincense and myrrh were just a bit over the top for people like them, and they knew it. Two friends of mine shared a different approach to the story, and their comments gave me pause. One wrote to say that every time he hears the story of the Epiphany he thinks of a song about the magi by James Taylor: They Went Home by Another Way. I could not recall that song, so I googled it, listened and immediately recognized the tune. That’s also when I realized I’d never paid much attention to the lyrics. Now that hauntingly lovely song is firmly fixed in my mind, and the next time I hear the story of the Epiphany I’ll access my mental link to the song. That’s a great take-away to draw from the Epiphany. We don’t know how it impacted the shepherds, but it changed the lives of everyone else involved. “They went home by another way” is just a more poetic way to say that after Bethlehem the lives of the magi, Joseph and Mary were never the same again. For them the encounter with Jesus was life-changing. They could not nor would not go on with life as it had been. The circumstances demanded something new, and they rose to meet the challenge. That, I think, is what can happen to us in the Epiphany. When we encounter the Lord, be it in a conversion experience or in the daily twists and turns of life, we can never be the same. Certainly we have to go back to our routines, but the routines demand something better of us. Happily, that’s what the Lord likely had in mind for us all along. +On 7-9 January I participated in the annual community workshop of the monks of Saint John’s Abbey. +On January 9th I gave a presentation on The Saint John’s Bible to faculty and staff from Saint Edward’s University in Austin, TX, who were visiting as part of a program entitled “A Year With The Saint John’s Bible.” Following lunch and my talk they visited the new Bible Gallery in Alcuin Library. 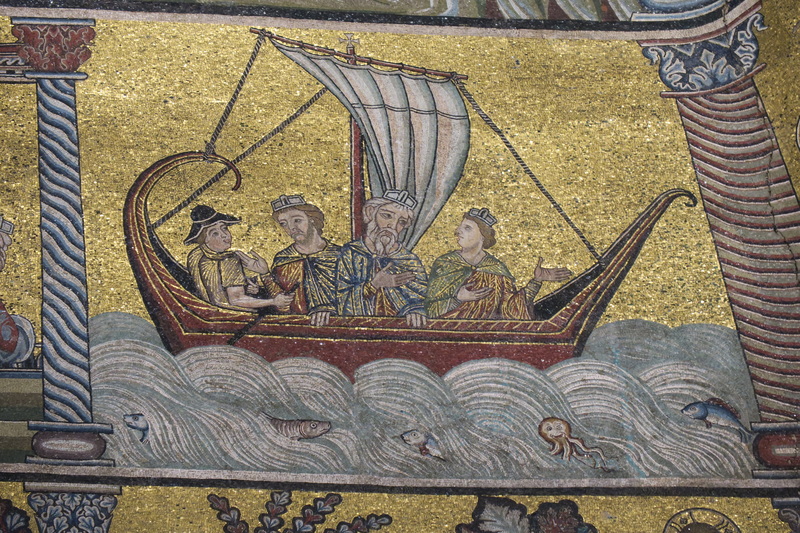 +The photos in today’s post are of medieval mosaics in the baptistery of the duomo in Florence. 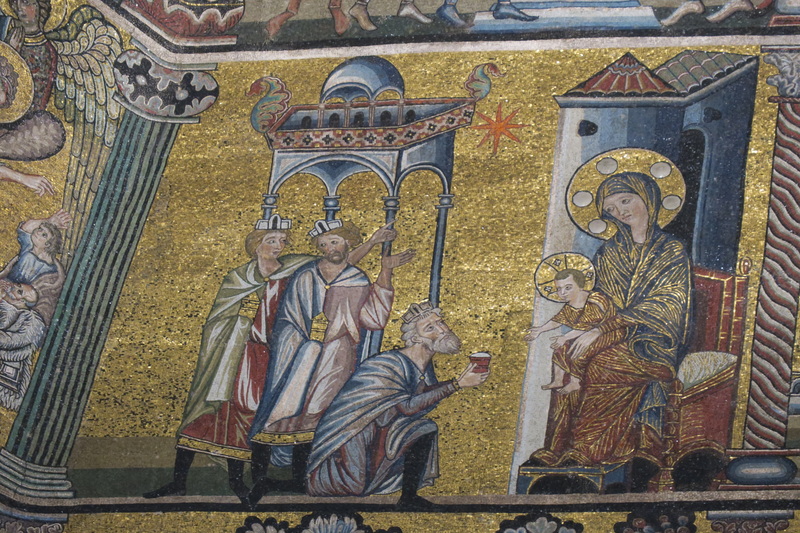 At top the magi present their gifts to Jesus. 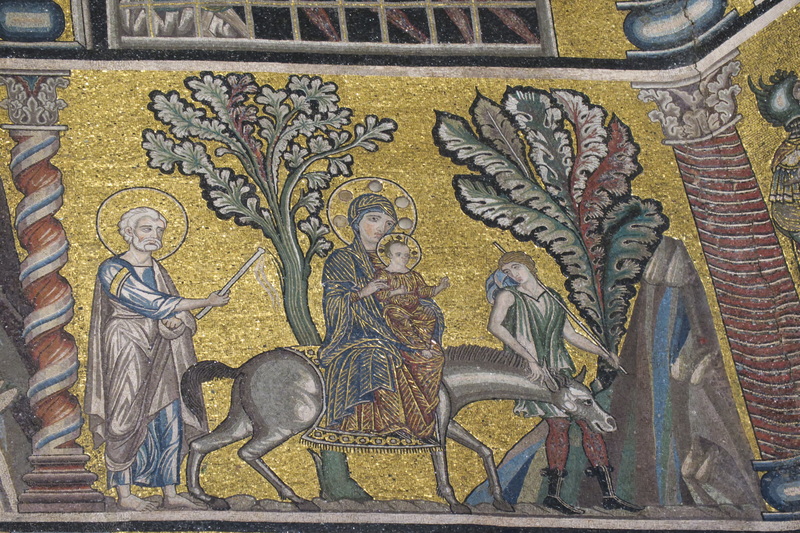 The second photo shows the magi being warned in a dream, and in the third photo they return home “by another way.” Below is a scene in which the Holy Family goes into exile in Egypt.